Mr.L's Tavern: Mr.L's Tavern Episode 64: Waterboarding Got Osama, Not Obama. 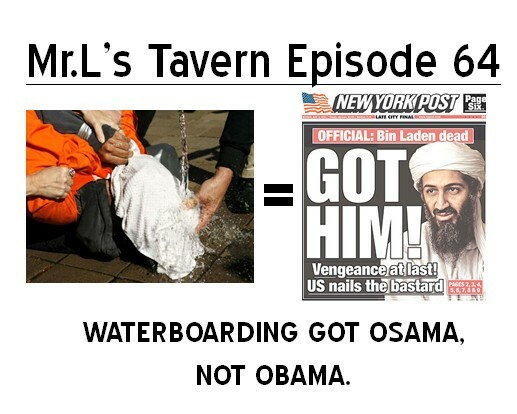 Mr.L's Tavern Episode 64: Waterboarding Got Osama, Not Obama. Osama dead, shot in the head. Now the anti war Obama is trying to take credit for it. It was our troops, Intel and Bush policy, in particular the controversial policy of water boarding via enhanced interrogation aka rendition, that led to the killing of Osama bin Laden. How the media covers the killing. White House rally of college students was only about Obama. Where's the photo of Osama? Where's the video of him eating lead? Why the Islamic burial in the sea? These questions and more.